These are only a few of the many ships carrying Latin Americans to U.S. internment facilities. Some are large documents and may take additional time to download. All manifests were found on-line. New Orleans Passenger Lists, 1820-1945 [database on-line]. Provo, UT, USA: Ancestry.com Operations, Inc., 2006. 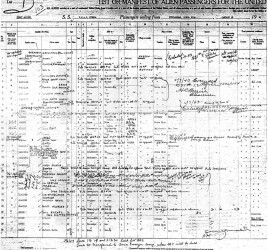 Original data: Passenger Lists of Vessels Arriving at New Orleans, Louisiana, 1903-1945. Microfilm publication T905. 189 rolls. RG 85, and California Passenger and Crew Lists, 1893-1957 [database on-line]. Provo, UT, USA: Ancestry.com Operations Inc, 2008. Original data:varied; Records of the Immigration and Naturalization Service, RG 85; NA.